wyatt had his surgery on monday and he’s recovering well. the first couple of days were nerve-wracking mostly because his head looked so bad, but he’s looking better by the day and is out of the cone more than he’s in it. i was afraid he would get into excessive grooming and rip out his stitches, but thankfully he hasn’t. when i can’t supervise him properly i make him wear his padded necklace. he officially has 1 shorter rounded mouse ear now. 1 mouse + 1 cat. it’s terribly cute. this is me looking on the bright side. if you didn’t know, white cats are very prone to sun damage, especially on their ears and temples. once he’s fully recovered and going outside again he’ll be inside from 10-4 – the worst hours for sun exposure. the indoor restriction is agonizing. he’s meowing constantly and begging to escape into the wilds of the front yard. when he goes down for a nap no one is more relieved than me! while he’s staring outside he has a view of the new oriole feeder. and the new hummingbird feeder. jumbo sized so i don’t have to refill it 2x/week. my hungry oriole friends were going for joy rides on the old glass feeder and it kerplunked to the ground a few weeks back. they can’t swing on the new one so nothing gets dumped. i rejoice in small victories! i thrill at each landing! they could care less about the oriole feeder. don’t their oriole minds know the difference or that they could sit on perches fit for kings on the orange feeder or that i got it on special delivery from amazon dot come just for them? squeal! humph. my travel journal just returned from a round trip journey from the workbench to the trashcan. i gathered the book-making elves that live in my head and we got to work reconnoitering. problem-solving. trouble-shooting. having hissy fits. now we’re all better. never underestimate the value of a good cursing session on the outcome of a future sketchbook travel journal. just don’t. shite happens. we go on. and on and on and on. i pulled out my swedish placemat in anticipation of my trip to stockholm. in the late afternoon i stare at the yellow brick road of it imagine carol & i skipping through the swedish streets and riding through the glorious archipelago with ingrid who’s meeting up with us for a few days. oh the jolts of joy one can experience pre-travel are so good. ya know? we’re taking our gouache with us and we’re going to come home with little books full of kooky paintings. i started a book thanks to YOU, missus nancy frisch. before the fall by neal hawley. love tumbling into bed with it for my nightly read. another thing that i devoured today was THIS article. i love reading thoughtful pieces on how social media is altering the fabric of our lives. i’m just gonna stick to “old-fashioned” blogging. it’s where i’m happiest in the vast social media milieu. thanks for stopping by. keep me posted on your summer loves & travels. I’m going on a round trip over there this august, meeting up with Ingrid in the middle. Keep forgetting to see if you’ve read “The Curious Charms of Arthur Pepper”……Wonderful!! Your kind of book! Glad to hear Wyatt is on the mend! We once had a rat who had surgery and tried to rip the stitches out. Gruesome. I’m also glad the travel journal is coming along. I did a lot of cursing while assembling mine. I ended up doing a modified straight/pamphlet stitch because I was afraid just doing one row of stitches per signature wasn’t going to hold. Also discovered that punching holes in a couple of layers of book repair tape is STICKY. So I’m playing with the idea of other types of spines. I do like the flexibility of the tape. I’m traveling vicariously with you this summer! Looking forward to your posts. Hi! Thinking of you and Wyatt. Hope all is well this evening? Sweet Wyatt, feel better soon. I know your mom is taking excellent care of you. Mary Ann, I am happily anticipating your trip to Stockholm and cannot wait to see what you and Carol see and paint. Happy 4th! About 20 years ago, we visited the unique Buchard (?) Gardens in Victoria, Canada. There was a busload of Japanese tourists who spent the entire time taking pictures of themselves and each other. They didn’t even look at the garden they had traveled so far to see, much less interact with other people. Sending light, sweet, gentle kitty kisses to Wyatt. I’m glad he is on the mend and sad that his romping in the yard shall now be limited. So sad. Kind of like telling one of your wee charges that recess has been permanently canceled for the rest of their lives. DD is house sitting this weekend and is cat herding 2 outside felines and trying keep track of them has been a challenge; Lucille and Bob have their own time clock and it’s not jvin’ with hers. LOL Our cats are indoor kitties so it’s been hard on her since she worries when she doesn’t see them for hours upon hours but they always come home. Cats shall be cats no if, ands or buts about that. I’m excited for your your journey to begin and will have to become a stowaway so I can enjoy all the sites and adventures. I’m excited for you Mary Ann. Your vacation travels are the best and you always find the perfectest place to explore and wander. PS. Me too, on the fireworks, the noise, our poor zoo, dog and the cats hate it, poor dog is a nervous wreck, the kitten is a little bit clueless but Tiger wants to hide down in the laundry room. I hate this time of year. Today it’s gotten humid and will be hot so now the AC is on and will be for the next couple of days so tonight we shall all get a better nights sleep than we’ve had in days. Thunderstorms might be coming in tonight and I can only hope for that since lighting fireworks in the pouring rain does not work so I say bring on Mother Natures fury. I am glad that Wyatt is recovering well! Can’t wait to come with you and your sister to Stockholm again this year. A couple of videos in IG would be lovely. Periscope is great, but if you miss one, it’s gone. I understand the orioles entirely too well….where’s the fun in bellying up to the bar they’re supposed to visit when they can enjoy all the thrills of an illicit raid on the forbidden nectar of the hummingbirds? Truly the nectar of the gods! Bon voyage! Enjoy your trip to Sweden! So glad to hear that Wyatt is getting better. That is all so stressful. I laughed out loud over your hissy fit comments. My husband says I shouldn’t be allowed to work with children (pediatric nurse) with a mouth like mine. I try to keep it contained to home but it certainly flies when I screw up something I am working on in my journal. Like a couple of weeks ago when I sewed my journal together with the fabric upside down. I had really ugly things to say with every stitch I ripped out (and there were a lot of them). Grrr! Looking forward to reading about all your adventures in Sweden!!! So glad to hear that Wyatt is on the mend! And, love the look of your travel journal. Wishing you a lovely, quietish 4th. First time commenting on your blog but I wanted to say thanks for sharing your art and your wonderful attitude towards life. I’m a kindergarten teacher too, mid-forties and I had a photography/this-is-my-life blog for about 5 years. My experience with social media is much like Lee’s, the previous poster. There was suddenly a glut of photographs everywhere and a strange feeling of competitiveness and social pressure crept in and so the blog died a quiet death. Actually, if I ever did start it up again it would incorporate art and photography, much like yours. In the meantime, I follow art journal blogs voraciously and steer clear of Facebook. Anyway, I’m glad your kitty’s on the mend, don’t worry too much about how the journals look (it’s what’s inside that counts!) and have fun on your holiday! So very glad that Wyatt is recovering. And you, too. It’s not easy being a cat mom with an ailing or healing cat and especially one that wants OUT right now. When Annie, my orange tabby, was spayed, she escaped one day and headed off down the fence wearing her collar. I was terrified. Luckily, it wasn’t long and she was on the front porch saying, something is very, very wrong here. Help! I’m so glad you’re gonna stick to “old fashioned” blogging. I’m not plugged into the other online social media venues. I always enjoy my visits to your blog. Love your June 28th gouache. Get well Wyatt. Looking forward to seeing your cute new ear. oh Wyatt is an absolute doll! Poor Sweetie…can’t wait to see the new Portrait of him in your Sketchbook…with his new hair do! I think I already mentioned, I loved Queenie Hennessey……made me cry on my flight from Sacramento to Denver…..
And i am happy you stay with your ‘old fashioned’ blogging! I am always happy to read you take notice at the ‘little things’ in life. I wish you will have good days with your sister Carol in Sweden, and i’m looking forward reading about your adventures! So glad to know Wyatt is recovering well! This kind of ordeal (before/during/after) takes a lot out of petparents! There have to be a lot of people for whom photographing takes the place of seeing. I don’t understand it, but I have to think that it’s so, given the number of times it comes up. Looking forward to seeing some Sweden through Moss-sister eyes! Bon voyage! i like IG too. too much sometimes. i’m trying to limit myself to one scrolling through per day and i try and only follow feeds that don’t overpost. right now following lots of stockholm feeds. wahoo!!! i was going to periscope from stockholm but instead i think i’ll do a little 30 sec video/day on IG. it’s so easy. no editing. no uploading. and i do love looking back at my videos in a year’s time. what’s your IG handle??? I’m very pleased to hear Wyatt is doing well and I’m sending healing wishes his way. Glad to hear you’re continuing with blogging… it’s still my favorite way to connect with others! When I was a child I HATED tomatoes. Now I LOVE them, and exactly like that, with salt and pepper. YUM. So glad Wyatt is healing up! Those collars are so darn humiliating for a cat, but sometimes you have no other choice. It’s for their own good, and I hope they forgive us eventually. You can’t believe some of the bandaging and wrapping things I have tried on my animals to keep them for digging at themselves. White horses are also very prone to skin cancers. By the way, did you know that white horses are actually grey horses that turn whiter the older they get? It is true, I tell you. Anyway…glad to hear that you have snit fits over art things too. Thought it was just me. However, I Really love how it turned out. That paper on the spine is divine. Poetic. I hope everyone has a fantastic 4th. I absolutely cannot wait until it is over, because the noise and smoke turns me into a PTSD patient. Mostly because I have animals that are noise and light sensitive. The poor critters! I always think of the critters. I stay up I until about 2 AM until most of it is over so I can let my horse out into her paddock when the chaos is over. I leave a light on in the barn and play music loudly to block the explosions. My husband always goes to bed early, so I usually start a fire in the fire pit and sit out watching the fireworks alone, and sipping a cocktail. Staying up late is the worst part. Even though we live out in the country, people out here love the 4th and it goes on for days. The m-80’s make me want to jump out of my skin. Did I say I can’t wait until it’s over? Blathering again. Thank you in advance for your patience. Take care and have a wonderful weekend! same here karen, it’s a total war zone. i don’t know what m-80’s are but if they’re the extremely loud bomb sounding fireworks…yeah. every 5 minutes. i open the windows a crack, turn on the whole house fan and it rumbles us gently through the night. such a good sound buffer. the furpeople stick close by. Semding love, light, and good karma to Wyatt and you. Hoping he recovers quick and he is outside at his designated times soon! I do so enjoy your blog, your photos, and your ideas. I am wrapped up in social media because of my jewelry business, but otherwise, it is a time sucker. I wish I had time to blog. I want to make jewelry, paint, read, cook, garden, live, and that is just a start! Love your new journal! Poor Wyatt! No fun having to wear one of those silly collars – I can only imagine… Good he is recovering well. 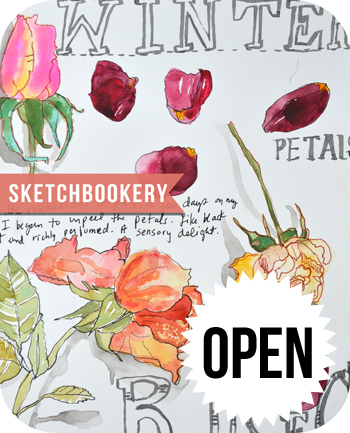 Thanks for sharing your struggles with your sketchbook process. Shite happens- to all of us, even you it seems. That’s a bit comforting to realize. Poor Wyatt…this too shall pass, buddy. Glad he’s going to be okay. I so enjoy all your photos and commentary and am so glad you blog. Looking forward to traveling vicariously with you and Carol to Sweden! Happy 4th Mary Ann! I’m glad that Wyatt came through his surgery well! I really appreciated reading the article about how much things have changed since so many are obsessed with showing photos/videos of what they are experiencing on FB, Instagram, Snapchat, etc., and it helps me to understand why, after many, many years of loving photography I lost most all interest in it starting about 5 years ago. It seemed like everyone had suddenly become a photographer overnight, and there was so much content out there to see. Image overload it’s called. These days I concentrate on experiencing things a lot more that trying to get likes for my images. I much prefer blogs like yours, where you’re telling a story with your images. I never tire of it – been reading your blog for years!